The oldest operating winery in Lodi, California, Oak Ridge Winery originated as a winemaking cooperative of local grape growers. Today, the winery is owned by the Maggio, Reynolds and Dondero families, who are committed to introducing as many people as possible to their wonderful wines. Lodi has long been blessed with warm days and cool evening breezes, creating ideal growing conditions for Cabernet Sauvignon, Merlot, Chardonnay, Sauvignon Blanc and Zinfandel. All of these top Lodi varieties have thrived through the years in Oak Ridge Winery’s vineyards. In fact, under the direction of Nick Karavidas and winemaker Chue Her, Zinfandel is a singular phenomenon. The portfolio presents an impressive series of handcrafted Zinfandels using Old Vine grapes. The 2010 Maggio Old Vine Zinfandel won Gold at the 2010 San Diego International Wine Competition and was named one of The Wall Street Journal’s WSJ Wine Club Annual dozen Best Buy Wines from a field of 800 entries. Another Zin, the 2010 Moss Roxx, earned gold medals in the 2010 San Francisco Chronicle Wine Competition, the 2010 San Diego International Wine Competition and the 2011 Pacific Rim Competition. The winery produces its wines in small lots and maintains its tradition of offering custom winemaking services to other Lodi wineries. After an extensive and comprehensive renovation in 2002, Oak Ridge Winery’s state-of-the-art facility is able to meet greater volume, style and quality demands. Family-owned and operated, Oak Ridge offers several special venues for both small and large private get-togethers. Undoubtedly, the most unique of these is the winery’s tasting room. 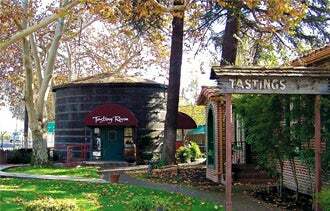 This historical landmark was converted from the original winery’s 50,000-gallon redwood tank. It still serves as a fun tasting room by day and an intimate party room by night for up to 20 guests. The winery’s original brandy distillery is ideal for banquets of up to 175, and its adjacent courtyard hosts groups of up to 60. T&T: How did a Southern California boy like you discover Lodi? NK: When I was 18, I headed out to Rancho Cucamonga, which was a significant wine region back then. I worked for Brookside Winery, an industry giant. When I left two decades later, I told myself I wasn’t going to work for anyone anymore and targeted Lodi as the next great up-and-coming wine appellation. Lodi had seen a real surge in plantings in the 1990s (about 80,000 acres were planted there in eight years!) and I knew there weren’t enough wine professionals living there to support its growth. I didn’t just see potential, but great potential, and I was right. T&T: And then how did you get involved at Oak Ridge Winery? NK: Shortly after arriving in the Lodi area, I started a consulting business, which was doing very well. During this same period of time, Rudy Maggio and Don and Rocky Reynolds had recently purchased Oak Ridge Winery with the intent of repositioning into the wine business. I was hired by Oak Ridge Winery for a few projects that went very well, which led to Rudy asking me to come on full-time as the general manager in late 2003. T&T: How has Oak Ridge Winery managed to expand distribution so successfully since you’ve been on board? NK: The short answer is “relationships.” It starts with the three families who own the winery: the Maggios, the Reynolds and the Donderos. The relationships they have with each other, their employees and others in business are of paramount importance. Thanks to their strength and integrity, we’ve been able to network with other industry leaders in an array of business endeavors. T&T: What are your major goals now? NK: Our goal is to continue to promote a family-owned operation while we expand distribution. We don’t want to ever grow so large that I don’t know the people who work here. I also want to help Lodi grow. I moved my family here knowing that this region would come up with the highest level of quality at the best prices. It’s great to help make that happen and to be in a place that is setting a new standard for California wine.